Old Man Winter is here for the long haul. One benefit of the frigid temps that winter brings, you’d think, would be an end to the fleas, ticks and heartworms that plague your pets during warmer seasons. Do you really need to keep giving those parasite preventives for pets all year long? The short answer: Yes. Believe it or not, many of these parasites are still active during the winter months, no matter how cold it may get. And year-round parasite preventives not only help safeguard your pet from disease, but they help protect your family’s health as well. Outdoors, fleas can survive in temperatures in the mid-to upper-30 oF range. They can also ride out the winter on dogs and cats huddled next to the skin where it’s warm. Also, the flea eggs that fell into your carpeting and furniture last summer may develop into adult fleas in the temperate environment of your home this winter. On dogs and cats, fleas can cause uncomfortable itching, especially in pets with flea allergy dermatitis, which results from a severe allergic reaction to flea saliva. And once fleas are in your home, it can take months to get rid of them, and you run the risk of the people in the house getting fleas as well. Because fleas can contain tapeworm larvae, pets can become infected when they accidentally ingest a flea during self-grooming, and children can also contract these tapeworms. Why risk it when monthly preventives can help protect your pet and keep your house from becoming a flea gathering place? Contrary to popular belief, ticks don’t die with the first frost. Some are just less active, while others search for a new host during winter thaws when it’s above freezing. Still others can live year-round in homes and kennels. As the deer and wild turkey populations have expanded across the U.S., they’ve carried ticks with them to more geographic areas. And ticks aren’t just limited to woody areas. Landscaping in our suburbs and cities has attracted coyotes, foxes, raccoons and other wildlife, all of which can carry ticks into the urban areas. Ticks can transmit disease-causing agents to your pets. And ticks are equal-opportunity parasites: they’re happy to share infective organisms with you, too. Heartworm disease has been reported in all 50 states of the U.S. This potentially fatal disease affects both dogs and cats and is very preventable. Mosquitoes, which transmit heartworms, can live year-round in many parts of the country. 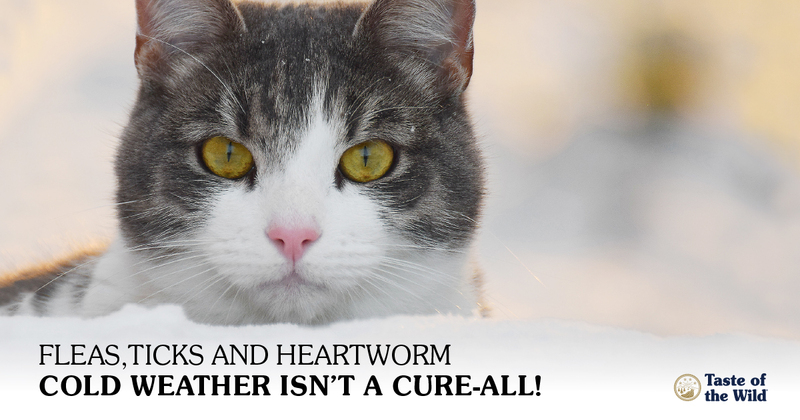 All it takes are a few days of temperatures above 57 oF, and the heartworm larvae can develop to the infective stage within the mosquito, ready to be transferred to pets with a single mosquito bite. These insects can also live indoors and transmit heartworms, even in the winter. In fact, approximately 30 percent of cats that get heartworm disease are described as “strictly indoors” by their owners. Most heartworm preventives also contain medication to help eliminate intestinal parasites such as roundworms and hookworms. Pets can become infected in the winter if they catch and eat an infected bird or mouse. Some parasite eggs, such as those from roundworms and whipworms, can survive freezing temperatures. If they’ve developed to the infective stage and the ground thaws, they can turn into larvae which pets can pick up from the environment or even at doggie daycare. If that’s not worry enough, many of these intestinal parasites are zoonotic, meaning they can be spread from pets to people. While many of us have enjoyed warmer winters in the last few years, once thing’s for sure: Parasites are flourishing in the more temperate weather, too. To help safeguard your pets — and your family — talk to your veterinarian about the parasite risks in your area. He or she can recommend the right preventives to help keep everyone in your home safe and healthy, all year long.